Do you want to know why I enjoy dining in restaurants here in the south of France? 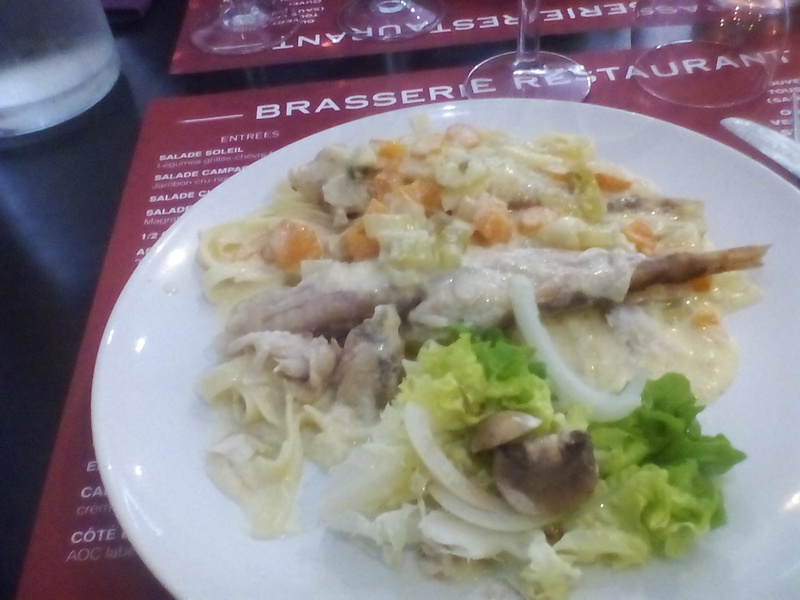 It's about places like La Cantine just across the street from Les Halles in Beziers. Fresh ingredients. Properly prepared. Value. Inviting exterior? Not really. Even with a slate out front with the menu of the day, on the brisk April day that we visited we weren't certain that La Canine was open for business. Well-appointed interior? With paper place mats and napkins, with standard bistro tables and chairs, with plates that aren't square or triangular, and with a couple of local amateur oil paintings on the walls, La Cantine doesn't spend time and money on ambience. Comprehensive menu? Nope. Two choices for starters and two choices for mains on the slate. And an a la carte menu sufficiently brief to appear printed fully, complete with desserts, in large type on those paper place mats with room to spare. Why would anyone want to eat there? Fresh ingredients. Properly prepared. Value. That's why. 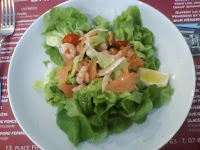 Our choices for a start were salade cœurs de canard or salade saumon fumé avec crevettes. I'm certain that I would have enjoyed the former but I'm a sucker for smoked salmon. Cathey joined me. The serving was properly sized, enough to soothe mid-day hunger but not enough to interfere with the main. 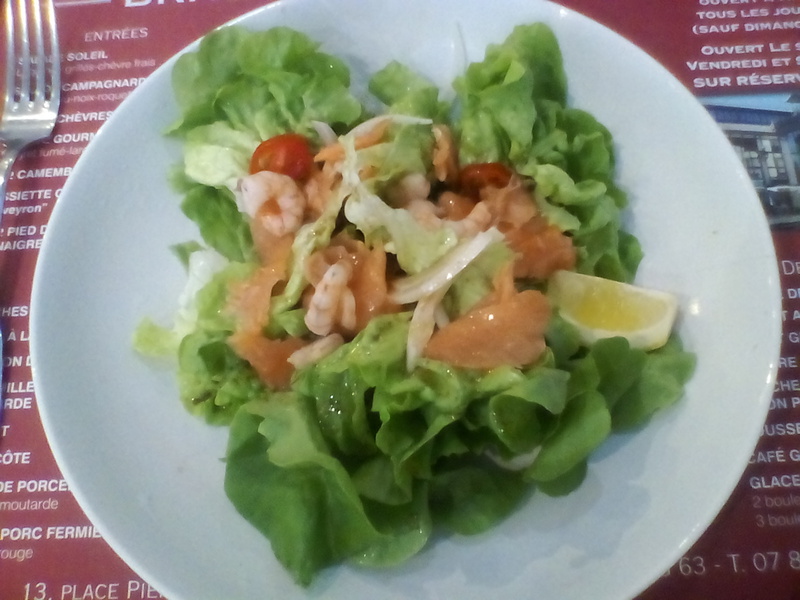 Plenty of bits of smoked salmon, a few sweet and tasty little shrimp, sliced onion, tiny halved cherry tomatoes, crisp lettuce, a simple vinaigrette, and a wedge of lemon for those who desired it. Nice. And the crusty, cereally bread chunks that our host cut off a fresh loaf sopped up the vinaigrette perfectly. I chose côte de veau avec crème de cèpes for my main. 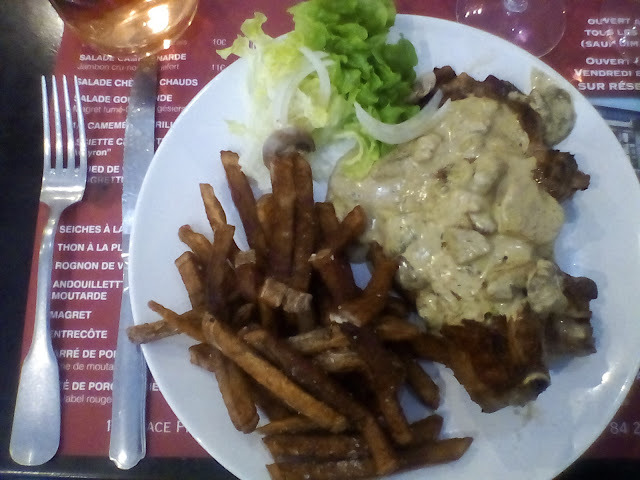 The veal was a good sized chop cooked hot and fast as it should be cooked and covered with a lightly spiced cream sauce with plenty of shrooms. Plenty of frites, too. Cathey's lotte en bourride was as fresh as fish must be, covered with pasta, carrots and celery, and a simple, barely reduced cream sauce. Recommended. You can read more of my food writing and restaurant reviews HERE. 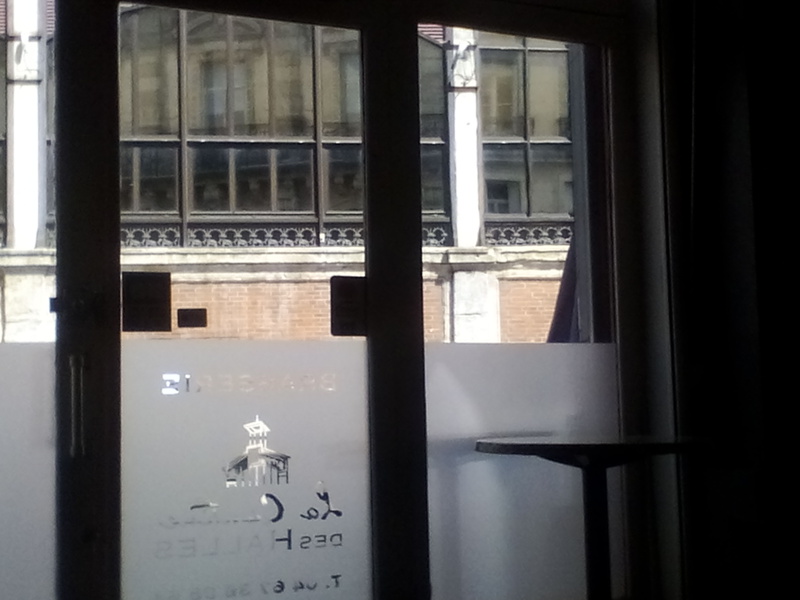 And there's Les Halles across the street. Shop first. Then lunch.